Winnipeg (IATA: YWG, ICAO: CYWG) Winnipeg is a Cree Indian word that translates to “Muddy Water”. First settled in 1738 by French trappers, Winnipeg lies at the confluence of the Assiniboine and the Red River of the North, a location currently known as “The Forks”. 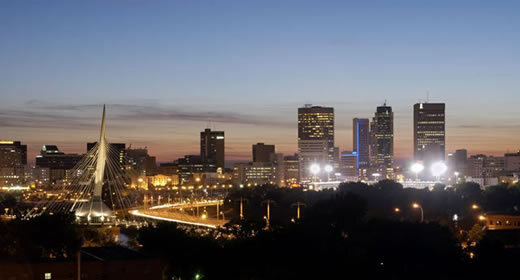 Winnipeg is the 7th largest city in Canada and the capitol of the province of Manitoba. With a vibrant arts and music scene that includes a Symphony Orchestra, an Opera and Ballet Company, Jazz and Folk Music Festivals, not to mention professional and collegiate sports, there is plenty to do! The city has a diversified economy, with sectors in finance, manufacturing, food and beverage production, culture, retail and tourism. Easily within the non-stop range of Desert Jet’s charter aircraft, Winnipeg is a frequent destination for our clients, especially those Snowbirds who enjoy spending the warm winters in the desert. Contact Desert Jet to learn how private jet charter can help you travel more efficiently between Canada and Palm Springs.